Click here to learn more about centrifugal pumps. Click here to learn more about positive displacement pumps. Click here to learn more about vacuum pumps. The Midwest’s Trusted Supplier of Industrial Pumps. The pump is the heart of any fluid processing application. A properly specified pump drives output and directly impacts an operation’s bottom line. Therefore, strategic pump acquisition is essential to maximizing production and profits. But, with countless process pumps on the market, selecting an industrial pump that is the right fit for your application can be daunting and time-consuming. Selecting the wrong pump can result in inefficient operation, equipment failures and production losses. Although the basic structure and operation of pumping systems haven’t changed much over the years, industrial pumps remain a sophisticated piece of machinery, each with its own ideal operating conditions and application. This makes pump specification a process that requires a great deal of specialized knowledge. For example, a larger pump isn’t always a good thing — in fact, an improperly sized industrial pump is a leading cause of process inefficiencies. Anderson Process’s in-house pump professionals are seasoned experts in fluid dynamics and will help ensure that your pump is the best possible fit for your specific application. We work closely with customers to select the pump that is the ideal type, size and configuration for your operation — something most warehouse suppliers simply can’t do. Anderson invests the time to learn about the unique needs of your application to ensure the pump specified will operate at its Best Efficiency Point (BEP) in your operation, as well as minimize cavitation. With the support of Anderson’s pump repair and maintenance program, our process pumps often achieve increased meantime between failures (MTBF) and deliver a lower total cost of ownership over their lifetime. Anderson Process offers a comprehensive line of industrial pumps and sanitary pumps ranging from air-operated double diaphragm pumps and centrifugal pumps to sliding vane pumps and circumferential piston pumps. 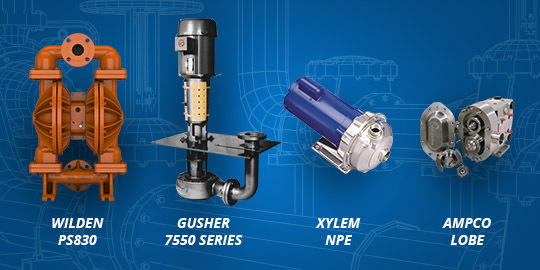 We partner with leading pump manufacturers — such as Wilden®, Graco, Gusher and Goulds — to provide pump systems that deliver reliable performance in demanding applications — from slurries and solids to high volume wastewater and corrosive chemicals. While many equipment distributors can provide “a” pump — at Anderson Process — we strive to provide “the” pump that aligns with your operation’s overall production objectives.